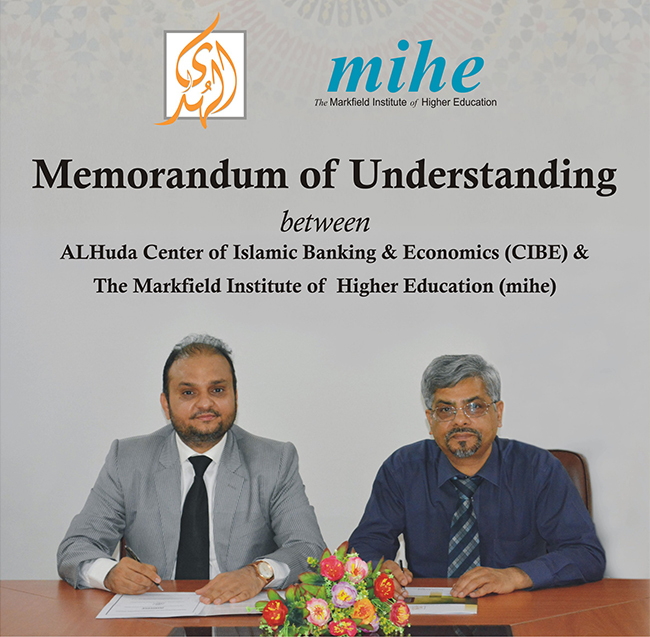 2nd August, 2017 (Lahore): AlHuda Center of Islamic Banking and Economics (CIBE) has entered into a Memorandum of Understanding (MOU) with The Markfield Institute of Higher Education (MIHE), based in the United kingdom. According to the MoU, holders of AlHuda CIBE’s “Executive Diploma in Islamic Banking & Finance” program with relevant English Language qualifications and work experience will be eligible to apply for exemptions from some modules on MIHE’s MA in Islamic Banking, Finance & Management program. With these exemptions students will be able to complete the master’s course in a shorter time period. The signing ceremony was held at the AlHuda CIBE office in Lahore – Pakistan on 1st August, 2017. Dr. Zahid Parvez, Principal of MIHE, Mr. Muhammad Zubair, Chief Executive Officer, AlHuda CIBE and AlHuda CIBE Head of Marketing Mr. Imran Gul Khan and Manager of Distance Learning Program Ms. Yusra Babar were present on the occasion. 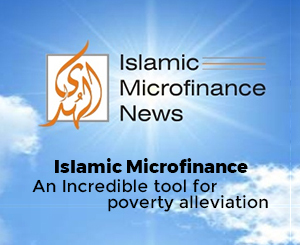 Under the consent, both parties are determined to collaborate for the enhancement of Islamic finance education, and CIBE will refer Students to MIHE for its MA IBFM course. At the ceremony, Dr. Zahid Parvez stated: "The aim of the MoU is to give recognition to the prior qualifications and work experience of Islamic banking and finance professionals and thereby enabling them to complete a Master’s degree programme in the UK in a much shorter period". Mr. Zubair Mughal, Chief Executive Officer, AlHuda CIBE, stated that, it is an immense pleasure for us to have collaboration with Markfield Institute of Higher Education on the master’s program. This will open a pathway for our students who complete our executive programs in Islamic banking and finance (which also covers Takaful, Sukuk, Islamic fund and Islamic microfinance) to higher education in the UK. He also mentioned that we have our students based in 72 countries worldwide, which is apparently a world Largest Distance Learning Program on Islamic banking and finance.